Task lists are all over in one form or another–calendars, schedules, assignments, and so on–but there’s always a need for a simple, basic, to do list. For those that work in even the simplest businesses, a to do list is a must have. Sometimes things get too complicated and what needs to get done is lost in endless technicalities. What a lot of businesses really need to do to stay productive is to get back to the basics and figure out two simple things: what needs to be done and if it’s been done yet. With a simple and clean format, this to do list template created in Microsoft Word® makes answering those two questions easy. It only has two sections, allowing anyone to maintain their tasks with perfection. Fifteen long boxes under a “description” heading give plenty of room to write down everything that needs to be finished. To the left of each one is a “done?” heading and a check area so it becomes obvious whether or not a task on this checklist template has been completed. 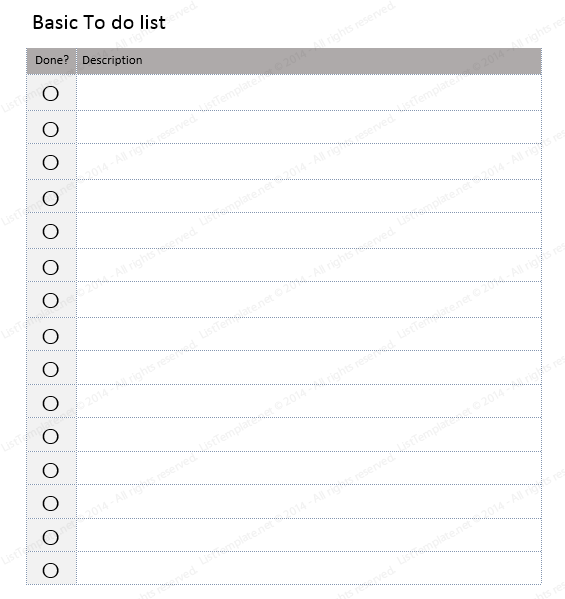 When in business, making sure that everything that needs to be done gets done should be the number one priority–and with this easy-to-use to do list template, that shouldn’t be a problem.